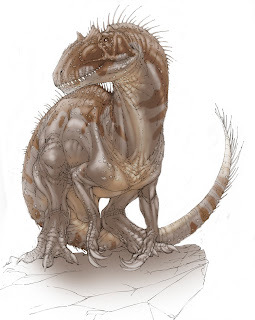 Aerosteon, it appears to be a later surviving Allosaur, or something very closely related. It had a respiratory system similar to modern birds. I've been drawing dinosaurs semi seriously for around 9 years now. I remember when artists like Todd Marshal and Luis Rey were just starting to get popular. I remember picking up the paperback version of Predatory Dinosaurs of the World (I just picked another hard cover of that one. That make 3 that I've bought over the years) while on a trip to Hawaii. I was amazed at what it had in it. Jurassic park had just come out and it had been about 8 years since I'd last really read bout dinosaurs. The art in that book fascinated me. It was like nothing I'd ever seen before. Dynamic agile animals, feathered raptors. It was amazing. To this day Gregory S. Paul is a favorite artist of mine. So what is this post about? Well it's been a few years since I started to try my hand at drawing dinosaurs, an the one thing I still see, is the influence of Gregory S. Paul. This is of course fine and dandy, I'm a big fan, his work is a great influence of mine. But most the artists who are so greatly influenced by him, and there are a lot, don't seem to try and develop their own style. They seem to have come to an approximation of Paul's and that's it, nothing new, no other influences. And while it's always great to see his art, the market has been flooded with clones. Now I'm guilty of this to a certain extant myself. I had a favorite comic artist that I aped, it's how I got hired originally. BUT after the initial honeymoon phase, I did try to branch out and develop my own style (I've heard it called the 'Brett Booth Beauty Academy'. Which I find endlessly amusing;)) I think I've made the transition to my own 'look'. So what I'm trying to say is that IF you are a Paul clone, why not try and experiment with some other styles, I'm not trying to get people to draw like me, I already have those in the anthro world and some even in the comic world. But my hope would be to help expand the artistic styles of some of the artist that I see with a lot of promise to break out and become the next Gregory S. Paul. Oh, and for goodness sake PLEASE take a few basic art classes (I know a lot of the artists are self taught.) It will help with perspective and some basic design work, help create some depth in the pictures. Of course some of you will say who the hell is this guy? He's not a professional paleoartist! True, but how many books with your name on it do you have on Amazon? I've draw thousands of illustrations for comics and the like, I've critiqued countless would be artists online and at shows. I have a degree in commercial art. I've been drawing comics for over 16 years. I'd have to have at least SOME design sense after all that (I'm not trying to toot my own horn just prove a point.) So why not take of the advice of another artist, try to expand on a good base and take your art to the next level. Gregory S Paul is pretty great, I remember the illustrations he did in a book called The News about Dinosaurs, its a small book for kids. It's probably been 16 years since I saw that book, but when I found it at a small flea market, I picked it up again without hesitation.